I remember as a kid I was fascinated by those seventies-lava lamps. 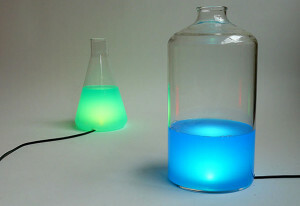 Belgian designer Maarten de Ceulaer gave the lava lamp a (sustainable) twist with his Colour Lights. Okay.. there isn't any moving stuff in the Colour Lights. But they're very nice to look at. Maarten de Ceulaer uses food colorants, water, coloured LED's and glass laboratory bottles. The result, a cool effect.